You may have noticed that things have been a little slow here at The Sweetest Kitchen lately. I apologize for that, but things have been busy here – all due to my children, who have ballet rehearsals and ballet concerts, or preschool concerts and preschool Christmas parties, or preschool orientations. During a break in these activities, I’d like to share with a recipe I found in the December 2010 issue of MasterChef Australia magazine. It’s so simple and makes a perfect side dish for any grilled meat. This is a twist on your average potato salad – there is no mayonnaise to be found in this recipe. The dressing is a mix of olive oil, finely chopped kalamata olives, parsley and garlic. 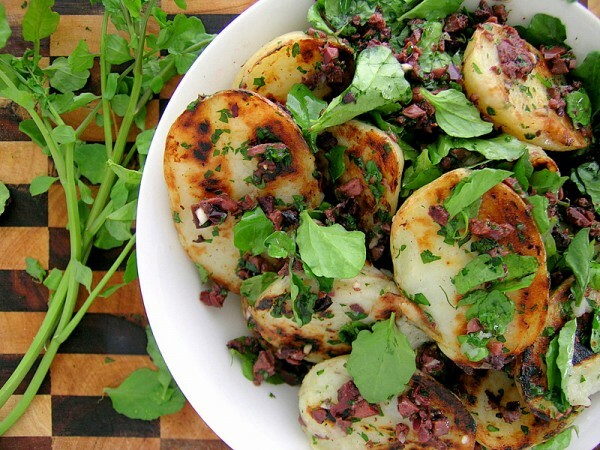 The potatoes are boiled, then fried cut-side down in a frying pan (or chargrill pan, if you have one) and finally the potatoes are tossed in the dressing and watercress is stirred through. It’s best served while the potatoes are still warm, but it also tasted great straight from the refrigerator as well. If you hate olives and are for some reason still reading this post, don’t be put off this recipe. I don’t like olives either, but believe it or not, while you can definitely taste the olives in a bite of this salad, they’re not so prominent. My 5-year-old daughter won’t come within 5 feet of an olive, so I didn’t tell her there were olives in this salad, and you know what? She absolutely loved every bite! My salad looks a bit messy, and it looks neat and tidy in the photo in the magazine! The original recipe asks that you chargrill the cut-side of the potatoes so you get black lines on the potatoes, which makes it look even more inviting to eat. Next time you’re thinking about serving potato salad, try this one instead for something different! 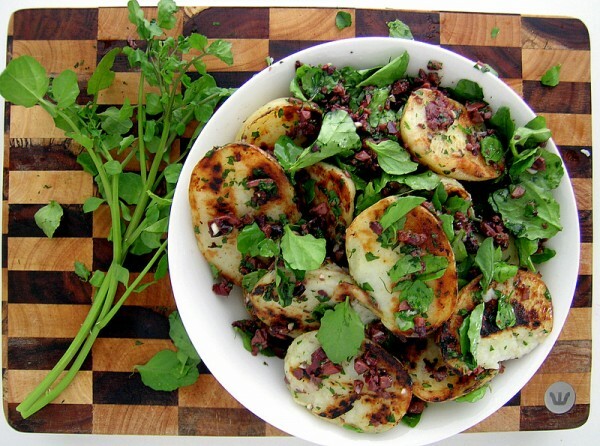 A twist on the classic potato salad, with olives, parsley and watercress. Place potatoes in a saucepan of cold, salted water; bring to a simmer and cook for 15 minutes or until just tender. Drain; cool for 5 minutes, then cut in half lengthwise. Cool completely. Meanwhile, combine oil, olives, parsley and garlic in a large bowl and season with sea salt and freshly cracked black pepper. Preheat a barbecue, chargrill pan, or frying pan to medium-high. Lightly brush the cut sides of the potatoes with oil, then cook for 2 minutes each side or until charred/browned. Immediately add the potatoes to the olive mixture and toss well to combine. Stir through watercress. Serve warm. What a great idea! I love olives and, though I’m not crazy about potatoes in general, they can surely be delicious with the right blend of herbs and seasoning. This sounds like a delightful salad – I can’t wait to try it out! Thanks for sharing! That looks great. What a wonderful salad. potato salads are the best! love the look of yours! hey dude are you coming to the sydney food bloggers picnic on sat? Gosh that looks good and delicious! I love that this dish features big, hearty chunks of potato. I’m not generally an olive fan, my my mother and father adore them so I bet they would really enjoy this and I bet the brininess of the olives matches well with the more starchy potatoes. I am not a big fan of watercress. What do you suggest I replace it with? Hi Mas Shaari, try replacing the watercress with arugula (also known as rocket).